For once, or for a long while at least, it seems that the glorious summer we have had this year has set up a bumper harvest for the coming autumn, especially with regards to wild food. By all accounts, the warm blast we had in late May and early June created perfect conditions for bushes and trees, encouraging them to flower abundantly. 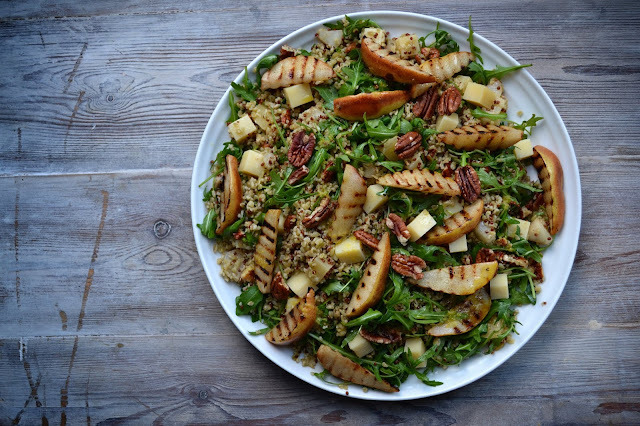 Coupled with further, unheralded days of sunshine and occasional doses of rain, the surrounding fields, parks, canal ways and pastoral roundabouts on busy highways should now be bursting with produce. And they are. Over the last few days I have been wandering around in a bit of a tizz looking at all the free stuff that nature suddenly has to offer. So much so, that I developed a crick in my neck. At the moment I have my grubby eyes trained on a particularly laden pear tree that is situated in an alleyway I use to get to the train station. It actually overhangs from someone’s back garden, so there is a tricky question of legality. Pears found on the floor are fair game. Pears plucked with my fair hand would constitute as stealing or ‘scrumping’; which is a much nicer word. I do have a plan though, which is to traipse repeatedly up and down the alleyway with a tall scaffolding pole on my shoulder. If the police get called, I shall simply tell them that I am lost. Thankfully, with regards to blackberry picking, I have been pretty much left alone apart from the odd, curious dog walker. I am lucky enough to live next to some farmland; a semi-bucolic idyll where roaming, lolloping fields compete with the distant thunder of the M25 and the blackberry bushes that line the hedgerows are teeming. I’ve been going out practically every other day with a carrier bag. Occasionally I take the children along too, as they love bruising their fingers and lips vivid purple but they often come back yielding bags of dripping with juice due to clenched fists. So I tend to go by myself. Still, we have managed to amass nearly 5 kilos of bramble fruit so far. All of which currently sits in our chest freezer, alongside lighter bags of elderberries (lighter because they are fiddly to pick apart afterwards). There are golden rules for foraging i.e. don’t pick too much fruit from a plant, leave at least a third for birds and it’s a good rule to abide by. But given the bounty of blackberries around at the moment, I would say that the gloves are off. Saying that, you might want to keep your Marigolds on, for fear of nettles, thorns and angry wasps. Whatever, I intend to keep hoarding for the time being. At least until Devils Spit Day on 29th September (otherwise known as Michaelmas). According to folklore, once ol’ Saint Nick has done his business on that day, all the wilted, musty blackberries will be no good for anything and there is an element of truth in that. With all the blackberries I am collecting, plans are afoot to make lots of jams, crumbles, sauces and cordials but the biggest thrill at the moment is that I have recently acquired a wine-making kit so I really fancy making some of my own country brew. Then if I’ve got it all wrong about Barry’s plums, well, a bottle or two could come in handy as a gesture of goodwill. This recipe for a rather sinful rib-sticking pud was inspired by a dish created by Skye Gyngell, formally of Petersham Nurseries. Rather than use stem ginger and lemon though, I have gone for orange and cinnamon which in my option marries up nicely with the inherent woody spiciness of blackberries. I used a single, medium sized pudding bowl but this would go down well if you scaled down and used smaller, individual pudding bowls. Preheat the oven to 180C. Butter your pudding basin thoroughly and set aside. Cream together the softened butter and sugar until pale and smooth and then add the eggs, one at a time, beating well each time. Sift in the flour and then gently fold into the mixture. Add the orange zest, cinnamon and a pinch of salt, continuing to fold until evenly mixed. 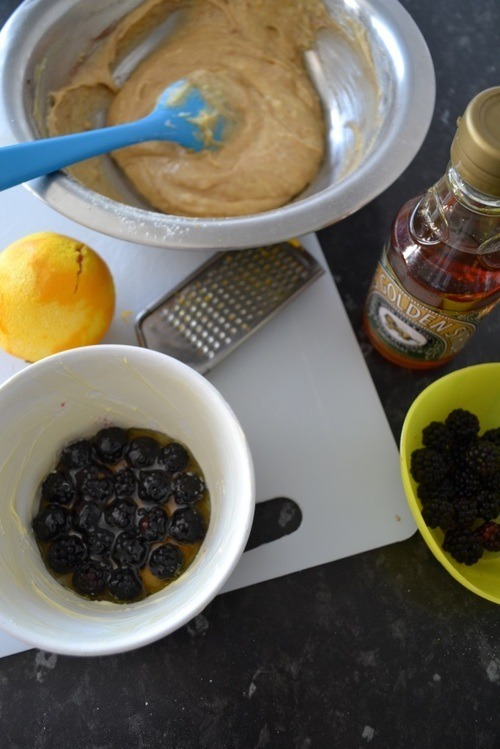 Place the blackberries in the base of the pudding bowl and drizzle the golden syrup over. Then spoon the sponge mixture on top. Cover the top of the pudding bowl with a round of foil, lightly greased with butter, stand on a baking tray and then place into the oven. Bake for 30 minutes until the sponge has risen and is cooked through. Test with a skewer in the centre, it should come out clean. Run a knife around the inside of the pudding bowl and turn out onto the centre of a plate, Pour a generous amount of cream over and serve. Looks delicious, perfect Sunday lunch pudding!